The solution above is common but not ideal because it does not reflect any structure. 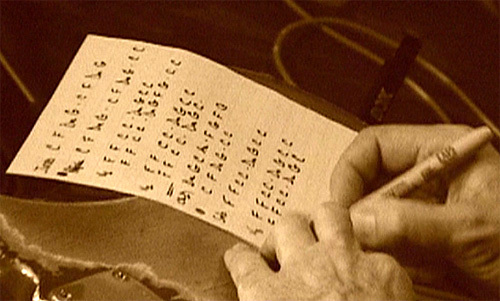 You might ask yourself how you can play such a song without a paper, like professional musicians do on stage? 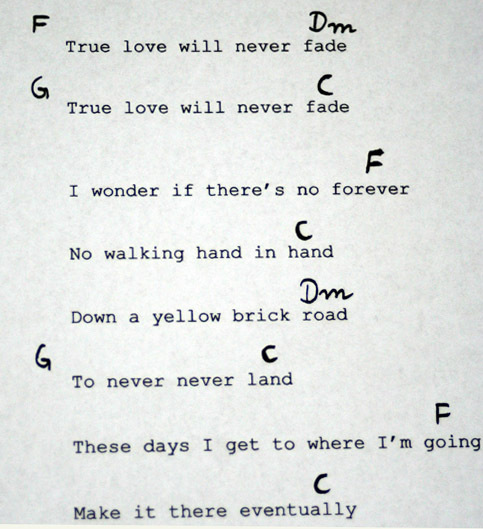 How can you learn a list of 126 chords by heart? The answer is easy: you need to be aware of its structure, of the patterns and logic it is built up with. Without structure, understanding is not possible. Without understanding, learning and remembering is extremely difficult. It is similar to understanding a huge mixing desk: you might wonder how someone knows what to do with so many knobs and controls, there are actually hundreds of them. But when you have a closer look, you will see that there are several channel strips that all have an identical set of controls. And the controls of each channel strip are structered again in e.g. the EQ section, the aux controls for effect sends, the monitor section, and so on. As soon as you understand it, the number of controls is no problem anymore, and you can find the right knob for each job within short time. Let’s apply the same logic to this song now. First we arrange the chords in groups, or sections. The first group is the intro of the song, and it consists of the first 8 bars. In fact you will find that certain numbers – e.g. 2, 4, 8, 12, 16, 32, … – play an important role in music. These are very often powers of two. Indeed music and mathematics are more related than you might think. If you look at these 8 chords, you will see that there is a group of 4 bars (C F Dm G) that is repeated ( 2 x 4 = 8, be aware of the powers of two). The third part – we might call it verse – starts with “…forever” (0:37). 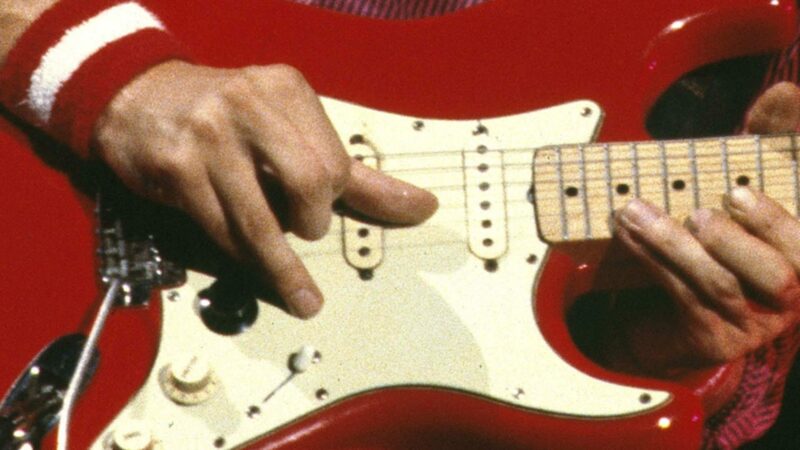 As the following part that starts with “I don’t know what brought you to me” sounds almost identical (melody, chords), we can consider it as a repetition of the part before and call it Verse B , while the previous verse A consists of the following 18 chords. F F C C Dm G C C – – F F C C Dm G F G – – C C.
F F C C — Dm G C C – – F F C C – – Dm G F G – – C C.
We see that the first and the third group are identical, while the second and the fourth are similar but not the same. The difference are the chords F G (red) at the end of the third group, they are inserted, they change the pattern. If you left them and played the two bars of C instead, you would have a simple repetition which is on the one hand more logical, but on the other hand it sounds a bit surprising this way, and thus adds something new to the song. If you compare it to verse A, you will see that both differ just where those chords previously discussed appear (red). Instead of the F G C C we have only one single bar C here. The total number of chords is for this reason only 15 which is very unusual (16 or 16 + 2 would be normal). We can say that one bar of C is missing, Dm G C C would be normal here (and would in fact sound logical). Leaving out this chord breaks the pattern and again adds something unexpected, it highlights the following part by breaking the rules. The last chords again break with the pattern. The expected would be something like C F Dm G C, with the last C as the final chord (the song is in the key of C so it should end on a C). The way it is here, however, sounds again unexpected and thus adds something. The following chart shows the complete structure of the whole song. I also used different colours to indicate different and related parts. 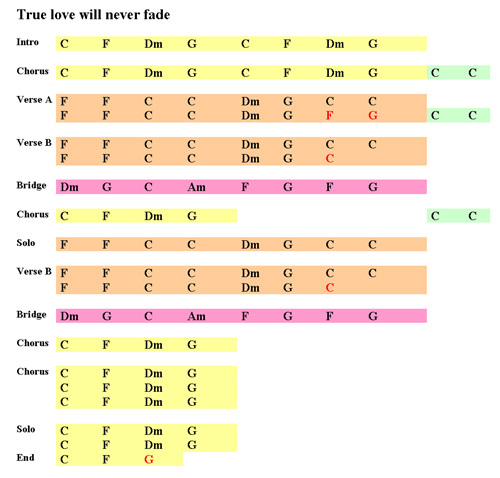 Compared with the unstructered list of 126 chords at the beginning of this article, you can see at one glance which part comes next, where something is repeated, and where something happens that breaks a standard pattern (red chords) . The number of different parts that you need to learn is kept to a minimum. At all those positions where a new part begins, a traditional note sheet would display a double bar line. Normally a drummer plays a crash cymbal there, and he might play a drum break before to usher in the start of a new part (on this song the drummer does not because the drum track is kept extremely simple). The beginning of a new part is also a typical position where new instruments might come in (e.g. note how the electric guitar comes in at the beginning of the first verse B), and the overall volume of the song might change here (note that commercial CD are often mixed at a rather constant volume as a consequence of the loudness war). I made the experience that when you work on a song with a band, it is extremely helpful to work with musicians who understand such a concept, and who think in terms of such a structure. Only this way everyone will know e.g. where to start best within the song to practice a particular part of the song, or how to play a difficult piece in a loop to get used to it or to bring it to perfection within shortest time. Everyone will know where to pay attention because something is unusual. The drummer automatically knows where to play the crash, where to play a break, where to change from hihat to ride, and so on. And only this way you can easily communicate with the other band members: everyone will know what is talked about, what is meant with bridge, first part, second half of … , and so on. Note: An analysis of the chords that appear in this song and their harmonic relation can be found in the article about the circle of fifths. great job! please keep this amazing stuff coming! Thank you very much for this awesome article!! A great insight. From now on I will look much closer at the songs I play to search for the structure. Thx Ingo – what seems like a deceptively simple tune has it’s little complexities. I think it highlights how Mark allows the melody to rule over the logical chord structure.